Messier 33 is the third largest galaxy in the Local Group, which contains the Andromeda Galaxy (Messier 31), the Milky Way, and around 44 smaller member galaxies. M33 is believed to contain 40 billion stars, which is significantly less than the two other large galaxies in the Local Group. The Milky Way is believed to be home to 400 billion stars, while the Andromeda Galaxy contains a trillion. 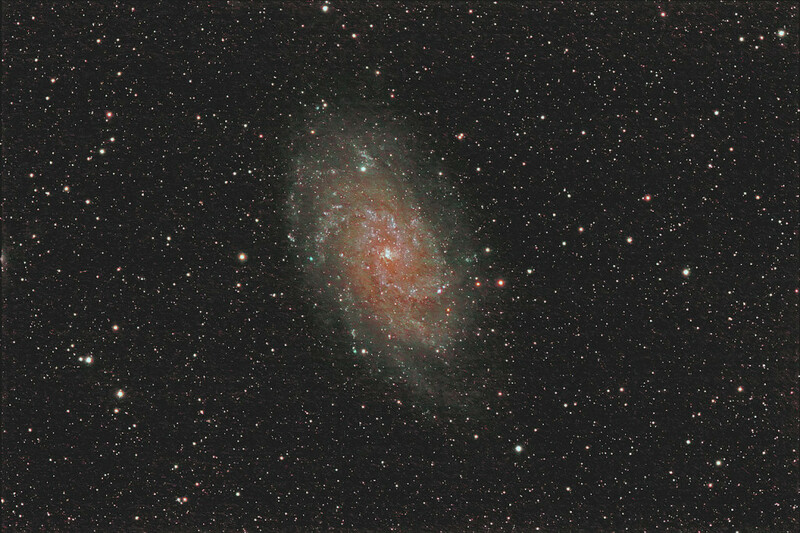 The Triangulum Galaxy is currently moving in the direction of Andromeda (M31). The two galaxies may have tidally interacted in the past, between 2 and 8 billions of years ago. Andromeda’s gravity pulled out a long streamer of stars from M33 and the streamer now extends from one galaxy to the other, with some of Triangulum’s stars now belonging to Andromeda. M33 may even be a remote but gravitationally bound companion galaxy of M31. The two galaxies are less than 300 kiloparsecs distant from each other and will eventually merge together, some 2.5 billion years from now, with the much larger Andromeda completely absorbing the smaller Triangulum Galaxy. The merger of the two galaxies may occur a billion or two years before Andromeda collides with our galaxy, the Milky Way. M33 is one of the most distant deep sky objects that can be seen without the aid of binoculars or a telescope. However, to see the Triangulum Galaxy with the naked eye, one needs particularly good viewing conditions. The galaxy is visible to the unaided eye – barely – but it appears diffuse and even small amounts of light pollution can affect its visibility. The Triangulum Galaxy has only half the width and 10 percent of the Milky Way’s mass, but appears as the second brightest galaxy in the sky because it is so close to our own galaxy. It is inclined at 54° to us, providing us with a “face-on” view. The galaxy’s apparent size is bigger than that of the full Moon. 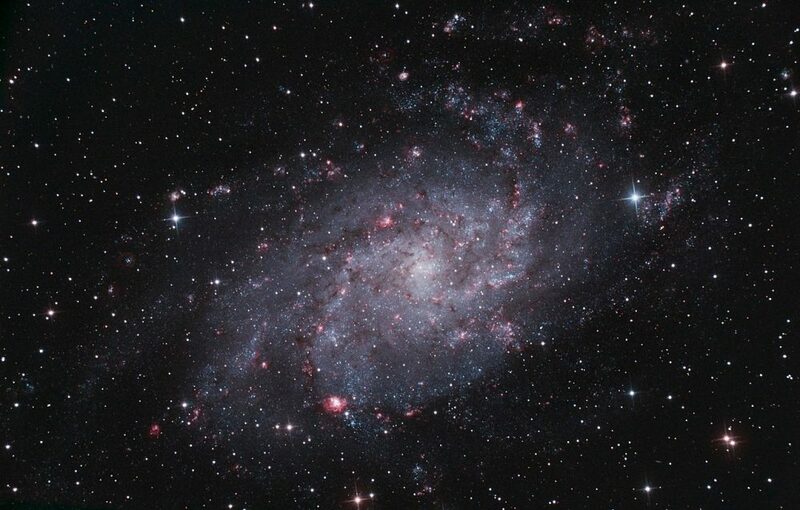 M33 has roughly 2.5 times the Moon’s diameter, with the dimmest outlayers of the galaxy reaching even farther out. Messier 33 is best observed at low magnification. Larger telescopes (over 40 cm aperture) can reveal some of the globular star clusters inside Messier 33. The Triangulum Galaxy is believed to have been discovered by the Italian astronomer Giovanni Battista Hodierna before 1654. He documented the object as a cloud-like nebulosity or obscuration. Charles Messier discovered the galaxy independently on August 25-26, 1764, and included it as the 33rd object in his Catalogue of Nebulae and Star Clusters of 1771. William Herschel, who normally tried not to include Messier objects in his own catalogue, made an exception with M33 and catalogued it as H V-17 on September 11, 1784. Wiliam Parsons, the Third Earl of Rosse identified the galaxy as a “spiral nebula” in 1850. M33 was one of the first objects to be identified as a spiral nebula by Lord Rosse, and it was also one of the first so-called nebulae that were later identified as galaxies. The German astronomer and astrophotographer Max Wolf and the American astronomer John Charles Duncan found variable stars inside the nebulae and, in 1926, Edwin Hubble observed that 35 of these variables were classic Cepheids, which allowed him to estimate their distance from Earth. The results affirmed the theory that objects identified as spiral nebulae were in fact independent galactic systems composed of gas and dust and not just objects inside our own galaxy. The Triangulum Galaxy is sometimes called the Pinwheel Galaxy, a nickname more commonly used for the spiral galaxy Messier 101, located in Ursa Major constellation. The Triangulum Galaxy is a type SA(s)cd galaxy, which means that it is a disk-shaped galaxy without a bar structure, with prominent spiral arms emerging directly from the galaxy’s nucleus. The spiral arms of the galaxy are loosely wound, which is indicated by the cd suffix. The galaxy’s main arms are designated north (IN) and south (IS). The southern arm contains a greater concentration of hot young stars, while the northern arm is home to four large H II regions. 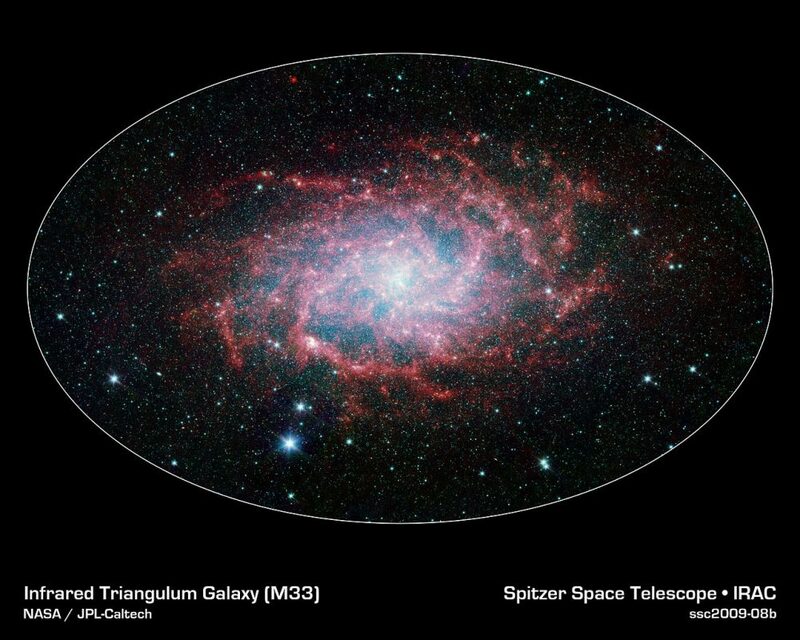 Unlike the Milky Way, the Triangulum Galaxy does not have a central bulge of stars. The nucleus of Messier 33 is a known H II region. It contains an ultraluminous X-ray source, the most luminous of its kind discovered in the Local Group of galaxies. An X-ray source lying so close to a galaxy’s core is believed to be a very rare occurrence. The Triangulum Galaxy is approaching our Solar System at the speed of 179-182 kilometres per second, and our galaxy at 24 kilometres per second. No supernovae have been discovered in the Triangulum Galaxy yet, but it contains about a hundred supernova remnants, most of them located in the southern half of the galaxy. 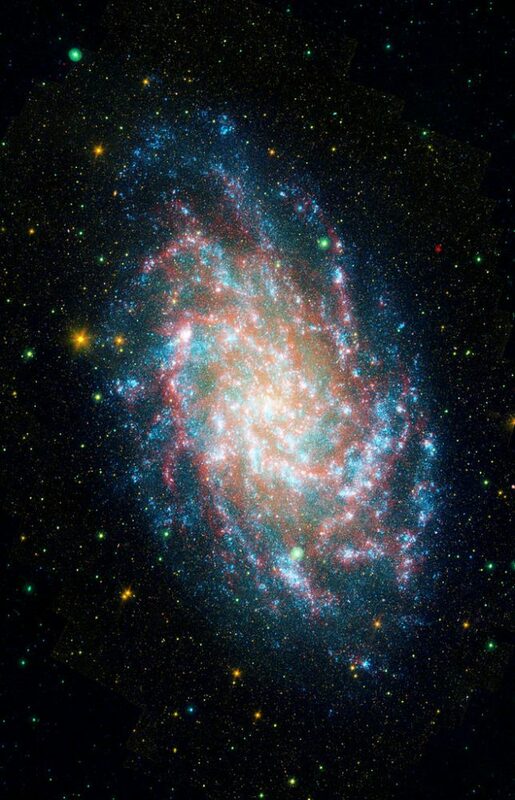 On average, a supernova explosion occurs every 147 years in M33. The galaxy is also home to at least 112 variable stars. Astronomers have identified around 54 globular clusters in M33, but there may be as many as 122 or more. The confirmed ones are believed to be several billion years younger than globulars found in our own galaxy. The formation of clusters has increased in the Triangulum Galaxy over the last 100 million years as a result of inflow of gas into M33’s core region. Messier 33 is believed not to have a supermassive black hole at its centre. The black hole at the galaxy’s core is thought to have only up to 3,000 solar masses, based on the velocity of stars found in this region. A black hole with roughly 15.7 solar masses was detected in the galaxy in 2007. Designated M33 X-7, the black hole is believed to orbit a companion star which it eclipses with a period of 3.5 days. M33 X-7 is the largest stellar mass black hole discovered. The Triangulum Galaxy can be found by following the line from Aldebaran (Alpha Tauri) to the Pleiades cluster (M45) in Taurus constellation toward Mirach (Beta Andromedae) in Andromeda, relatively near the bright stars Hamal (Alpha Arietis) and Sheratan (Beta Arietis) in Aries. 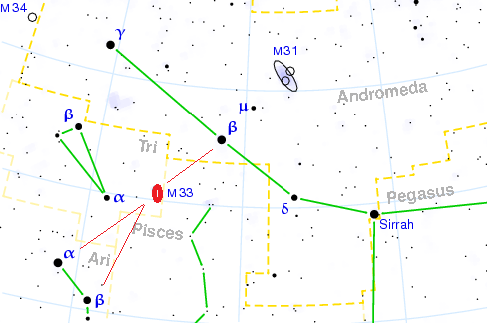 Triangulum constellation is located halfway between the bright pair of stars in Aries and Mirach in Andromeda constellation. If the sky is particularly dark, the galaxy will be just barely visible without binoculars. It is the only Messier object in Triangulum constellation, and despite having relatively low surface brightness, it is one of the most distant deep sky objects visible to the unaided eye. The galaxy contains several regions of star formation that have been assigned their own entries in the New General Catalogue. 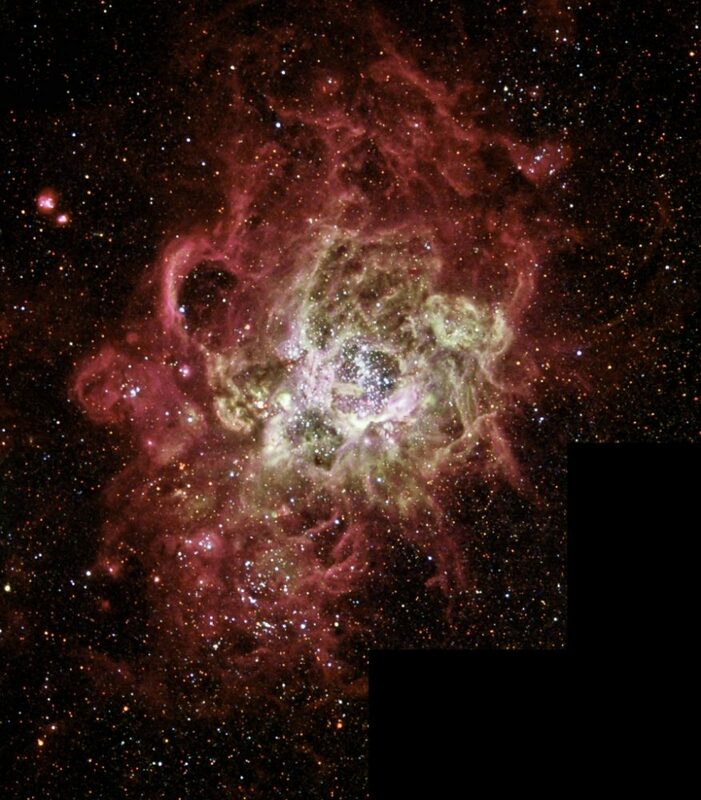 The best known one is the star-forming region NGC 604, and other well known H II regions in the Triangulum Galaxy are NGC 595, NGC 588, NGC 592, IC 132, IC 133 and IK 53. 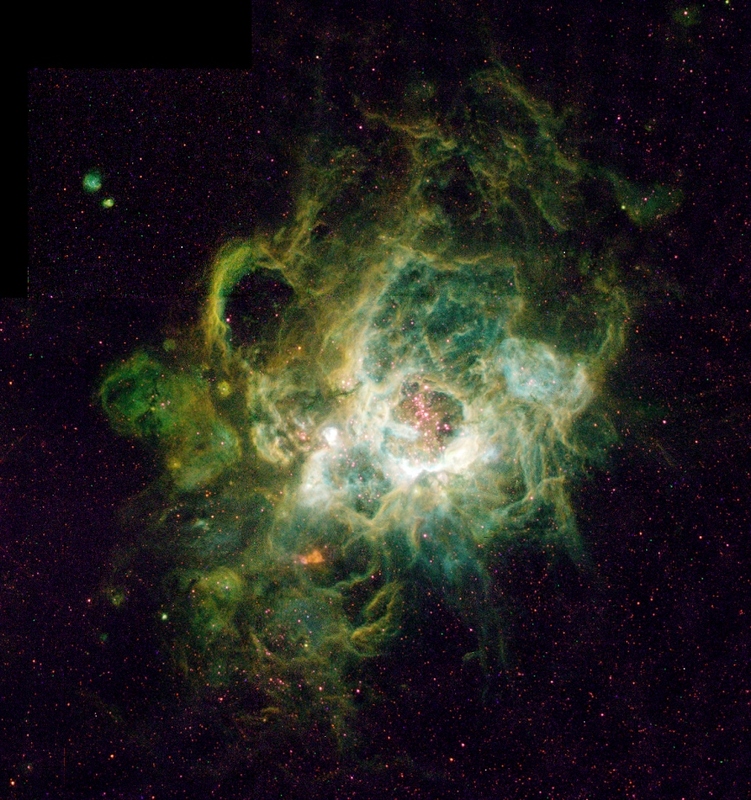 NGC 604 is the largest, brightest H II region found inside the Triangulum Galaxy. It is a diffuse emission nebula that lies to the northeast of the galaxy’s core. NGC 604 has a diameter of almost 1,500 light years, or 460 parsecs, which makes it exceptionally large, one of the largest known H II regions discovered in the Local Group. The nebula is more than 40 times the size of the visible part of the famous Orion Nebula in Orion constellation, and over 6,300 times more luminous. NGC 604 was first spotted by William Herschel on September 11, 1784. Herschel also documented the three smaller H II regions, NGC 588, NGC 592, and NGC 595. NGC 604 is lit by a cluster of about 200 massive stars belonging to the spectral type O and WR. The estimated age of the cluster is 3.5 million years. NGC 604 contains about 200 Type II supernova candidates.